Yesterday I posted a chart of 7 generations of my maternal side of the family’s work history. Today I’m going to do the same with the paternal side of the family. I have found Lewis and Judy Cleage in the 1870 US Census. I also found their marriage record. I am not convinced that all the children listed living with them are their children, if their ages are correct. But having no other information, I put them in. I do not know what work the children did in the future. I think I will look for them again. 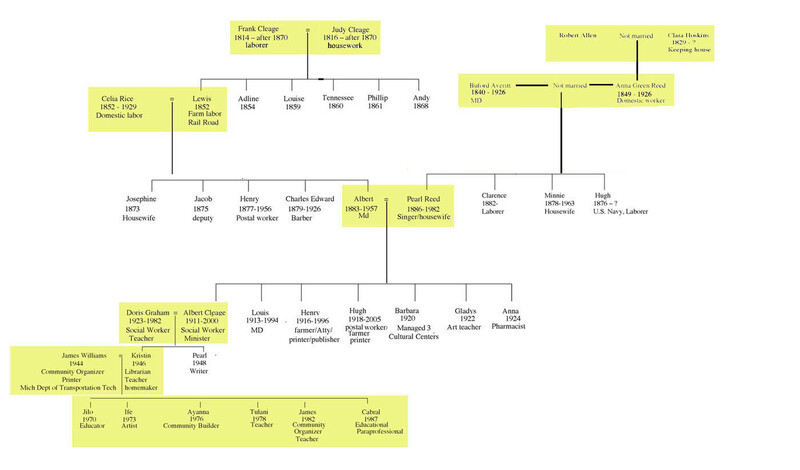 Annie Green Reed had two husbands and four more children but I left them off of this chart. They were all laborers or farmers or housewives. Both Buford Averitt and Robert Allen come to the family tree as white men who did not acknowledge their black offspring as far as we know. Oral history and records of birth, marriage and death account for their making it onto my chart. I’ve pinpointed Buford but there are several possibilities with Robert so he has no job here. My direct line is highlighted in yellow. You can see the same chart for my maternal line here Maternal Family Tree of Workers. 6 generations of my paternal line of ancestors and the work they did.